This site is Member supported. The way we "Keep The Lights On" is to "Accept Donations" and to offer products for sale that will supplement the donation stream. ...$20.00 for the first one $15.00 for the 2nd and then $10.00 for each one after that. 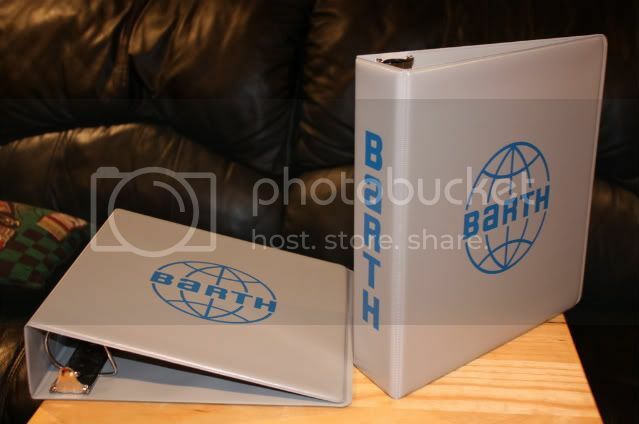 Another discounted offer is the New Barthmobile CD and Barth 3 Ring Binder set. 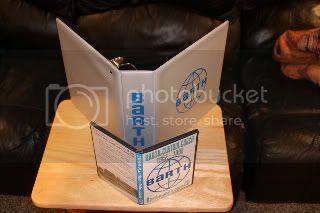 For a combined price of $40.00 you will receive one 3 Ring Barth Binder and a Barthmobile CD. The 2nd binder will cost an additional $15.00 with each one after that @ $10.00 each. This offer is available to everyone and also reflects shipping cost. If mailing to Canada or Mexico, please add an additional $15.00 to the prices. 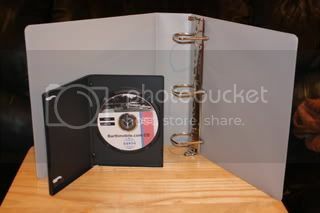 The original Binders were 2½” capacity with round rings; the new Binders are 2” capacity with Slant-D Rings. Because of the superior design of the Slant-D Rings, all literature will stay on the inside back cover when closed instead of getting caught on both sides of the cover and torn while closing. The artwork is a pretty remarkable reproduction of the original gray binders. This improved design and construction should make these binders last for years to come and it will be easier to handle too. Feren And Company did a remarkable job on these. Please make sure you list what your order is for. I know there are plenty of binders that are taped together. So, as an added bonus, I will be giving away a binder to the person who has the most pathetic looking original binder still in use. 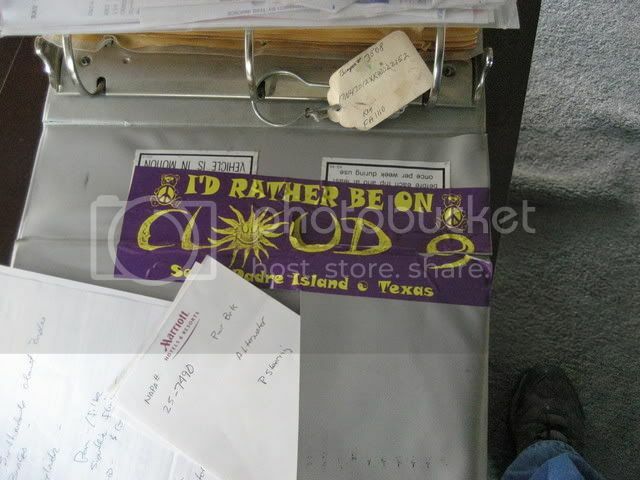 ...is Ray from Ormond Beach, Florida. 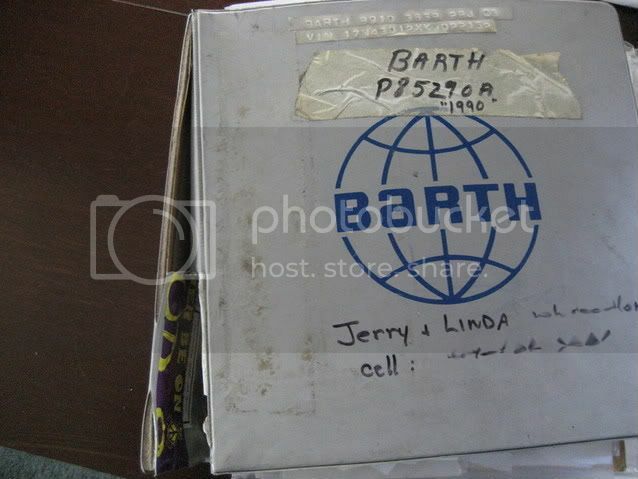 Congratulations Ray, that is truly one pathetic looking Barth Binder. But, is this truly the best of the worst? BTW: If there's a tie, or it's really close. The earlier entry will win. Sandbagging will not help you here. If you haven't ordered your new binders, hurry before they run out. Got mine today and they look like Mr. Barth, himself, did them. Better than the originals. The slant D-rings are a big improvement. Got mine and could only say WOW! These are not your high-school bookstore binders. 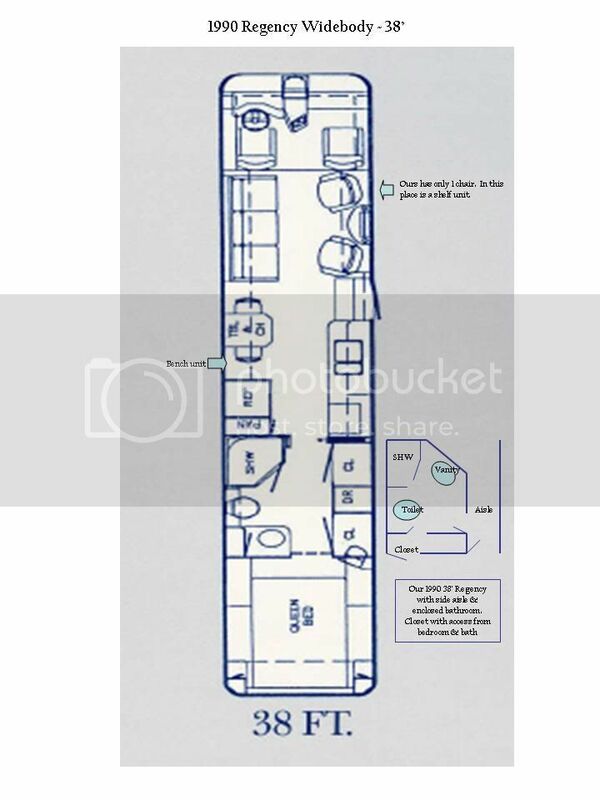 The construction, design, and shipping are all Barth- Class. 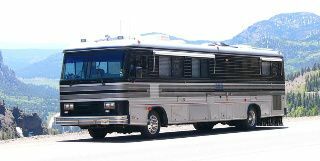 Thanks to Bill for keeping the price ridiculously low, and a reminder to those of you who order these that this is a good time to show your gratitude to Barthmobile in the form of $$$. 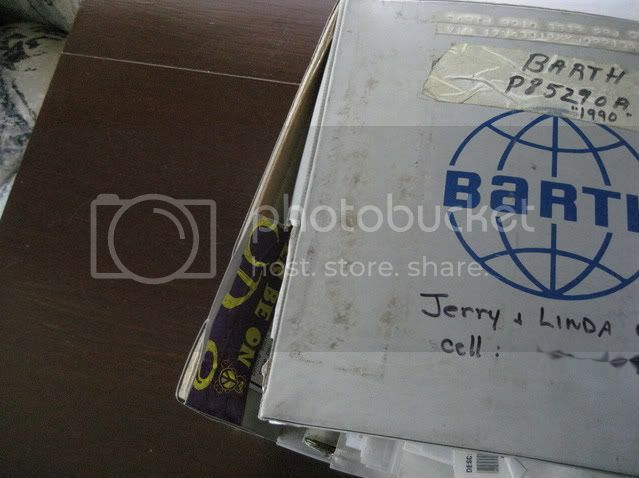 Well Ray, you must truly have "The Most Pathetic" Binder around. 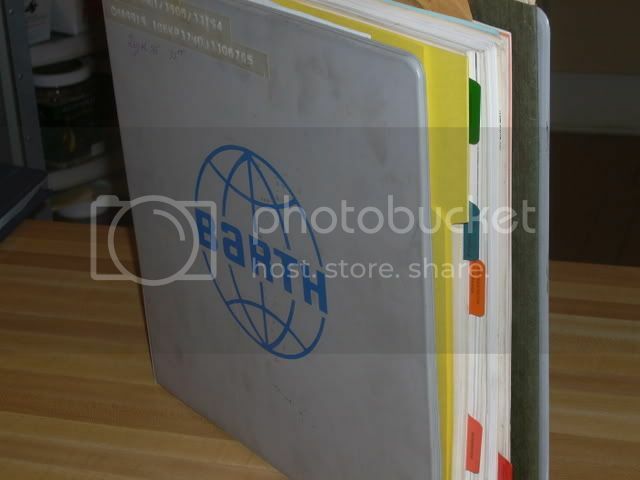 Another member sent me a photo of what appears to be a very well maintained binder. I'm only guessing here, but I think he was bragging about how good his looks. Send me an email or PM with your mailing address Ray and I'll send you 2 binders and a CD just for playing. Decision of judges is final, winner is responsible for all taxes. WOW, I really won something although I was expecting some other binders in similiar condition. Maybe I am one of the few that actually use the Barth binder. 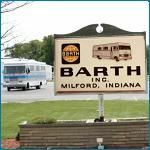 I will drop you an email with my mailing address and I will also make a contribution to Barthmobile for your generosity. ...although I was expecting some other binders in similar condition. Me too, I was hoping that this would be a fun contest as I was prepared to give away several. This is why I'm mailing you two. They're packed up, in the box, ready to go out tomorrow. Please update this thread when you get them and let me know what you think. Photo proof of new binders in use is always a classy bump. You do know that all winners are required to give glowing endorsements right? I received my binders today and, all I can say is WOW! No, I didn't say "Sham-wow." The quality is excellent and they look like the original. Well minus the two piece cover, the stains, stickers, etc. Other than that, they look like the orignal. Oh wait, they're higher quality than the original so, other than that, they look like the original! I received my binders today and, all I can say is WOW!... Oh wait, they're higher quality than the original so, other than that, they look like the original! I am really glad that you liked them. It bears repeating. Feren And Company did a remarkable job on these. Thank you Carl and Betsy for everything. Will you pardon my ignorance and advise what is on the CD?